Recruitee is an all-in-one hiring platform for teams of all sizes. It combines 4 essential products into 1 platform: employer branding, job promoting, talent sourcing, and applicant tracking. With an intuitive and playful design, Recruitee aims to help you streamline your hiring efforts and stay sane while growing your talent pool. Recruitee was named “Best Applicant Tracking System of 2015” by RecruitingTools.com. Now it’s quickly becoming the industry standard for fast-growing SMEs around. 1. Recruitee’s first product, an employer branding editor, helps you style and brand your site in no time to set up the right candidate experience. Showcase your company, your team, and your culture on a stunning careers site – optimized for mobile and integrated with Social Media. 2. Next up, Recruitee helps you find the best places to promote your jobs – free and paid. Learn where the best candidates come from and make data-driven decisions. Integrated with 800+ job boards, Recruitee makes sure that there’s always a right fit for your jobs. 3. The third product, a sourcing plugin for your browser. It helps you import passive candidates directly into your Recruitee account. Scout or import candidates from various web sources – LinkedIn, Dribbble, GitHub, Stack Overflow, Facebook, Twitter. 4. Last but not least, we believe that a good applicant tracking software should allow you to focus on finding the right candidate, not on administration. The intuitive drag & drop interface of Recruitee gives you a continuous overview of all your candidates and hiring stages. Send bulk emails, @-mention your colleagues, and review candidates together. Hiring is fun and effective with Recruitee. 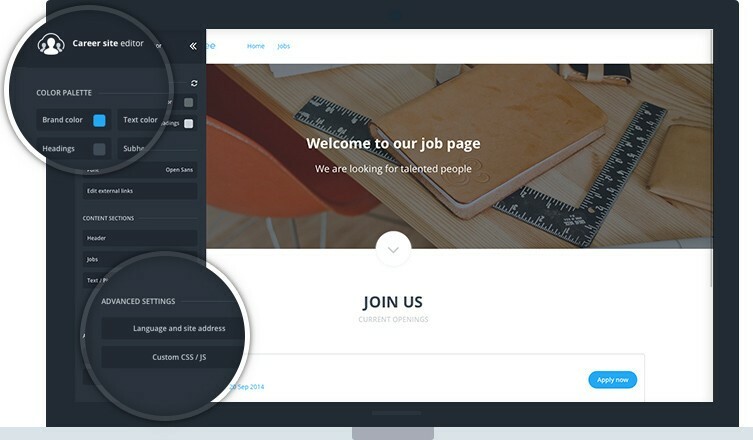 - A modular employer branding editor to create stunning careers sites. Mobile and Social proof. - Integrated with 800+ free and paid job boards. Discounted postings available up to 30%. - A Chrome and Firefox plugin to source passive talent from various web sources directly into Recruitee. - A dedicated team that is highly focused on UX and friendliness: Intuitive usage with a setup time close to zero. - API and job widget available to show jobs on your own website. - Free demo account available. Low-cost monthly fee model. With Recruitee, users are given full-feature access and are charged per company. You can invite unlimited colleagues/recruiters without extra costs. Also, you can set up different access roles per invite. Talent tracking & relationship management for premium recruiters. Recruiting software for the modern recruiter! You can easily create a beautiful, mobile-friendly job site that today's computer-savvy candidates will want to use. With integration into over 800 free and paid jobs boards and social media networks, Recruitee can get the word out fast when you have a position to fill. It even helps you scout out passive talent. Once you have candidates in your pipeline, Recruitee makes it as easy as possible to track and manage them. Let's look at each element of Recruitee in more detail. The competition for top employees is brutal. And today's candidates are mostly Internet veterans who have little tolerance for low-quality web sites. Recruitee makes it easy to create a modern, attractive recruiting site in no time. We're talking about a mobile-friendly site that is hosted for you by Recruitee, but is fully brandable. Customers report setting up a full employment page within a few minutes. How is this possible? You start with Recruitee's responsive core site design. Then you customize it by turning optional elements of the site on or off. You can then upload your assets (photos, messages, and so on), and apply your company branding. The result is a site that looks sharp, functions on whatever device prospective employees are using, and is uniquely yours. NOTE: The Employee Branding Editor supports advanced features like language support and hosting on your own domain. But you don't need to deal with any advanced features to create a quality recruiting page. Jobs differ in their requirements. The application forms should differ too. Recruitee includes customizable application forms. You can specify what standard information an applicant needs to provide (things like phone number, photo, and cover letter). You decide whether applicants can apply by pointing you to their LinkedIn or Indeed profiles, whether the job listing can appear on social media and whether or not you will disclose the location of the job. To help you screen candidates as early in the process as possible, you can add screening questions to the application form. These can be closed questions (yes or no or multiple choice) or open questions (free-form or essay type). Creating quality job descriptions is important to getting quality candidates. And listing those jobs on an attractive, mobile-friendly career site can only help. But you still need to get potential candidates to see them. This is where Recruitee's automated job promotion and sourcing tools come into play. Recruitee integrates with more than 20 free jobs boards and social media sites. Once you have a job description ready to go, you can click one button to post that job to all these locations. This is part of every Recruitee plan, assuring wide dissemination of your jobs. What about positions that need more specialized handling? The free boards and social media channels are not appropriate for every position. You might be looking for higher-level people, or staff in a different country. Recruitee can handle these situations too. The platform includes its own job board search engine. At the time of this review, it gave you access to over 500 jobs boards located in 47 countries. You can get premium listings on these boards, with discounted pricing through Recruitee. You can get free advice from Recruitee on using these boards for specific jobs. You can also use Recruitee to create targeted social media campaigns. Get your jobs listed on LinkedIn, Facebook, Twitter, even YouTube for the best results. The techniques we have discussed so far get your jobs in front of people who are searching for new positions. But you may also want to scout out talent that isn't searching right now. Recruitee makes this easier. They have created an extension for the Firefox and Chrome web browsers. Once you spot talent, the extension imports their information to Recruitee. While scouting for talent is hard work, importing talent takes just a few clicks. Once you have jobs posted, you need to be able to handle the candidates efficiently. This is a job for the Recruiting / Applicant Tracking part of the platform. As applications arrive, the candidates appear in your recruiting dashboard. You can review each candidate's qualifications from here. You can give an adjustable star rating to each candidate. This lets you pick out the most promising prospects at a glance. The entire recruiting pipeline appears in the dashboard. This makes it easy to see where every candidate is in the process. Making things even easier, the pipeline has a drag-and-drop interface. When you want to advance a candidate to the next stage of the pipeline, just drag them there. Likewise, you can drag and drop candidates within each stage of the pipeline to order them by desirability. Smart Analytics - The platform tracks the source of every candidate. Over time it can tell you which channels provide you with the best new hires. This allows you to spend your time and resources on the channels that provide the best ROI (Return On Investment). Customizable Pipelines - You can adjust the stages of the pipeline for each job. This ensures that the pipeline for each job matches your company's policies. Centralized Candidate Email - Handle all your email for an opening from a single screen. Whether you need to send a bulk mailing to every candidate, or target a specific individual, you can do it here. The mailing system supports attachments and email templates to reduce your workload. Recruitee's activity feed keeps the whole hiring team in the loop. It supports @-mentions for directing a message to a specific team member. Daily or weekly notifications are available too. The Recruitee web site includes a number of additional resources that will help you understand the platform and use it better once you subscribe. The Beginner's Guide, which takes you on a quick tour of the platform, from creating your first job opening to importing candidates. A searchable FAQ, with detailed answers to 70+ questions. Many are detailed, step-by-step instructions with annotated figures to guide you. A huge set of Job Description Templates. Over 200 templates in 16 categories to make creating a great job description easier. 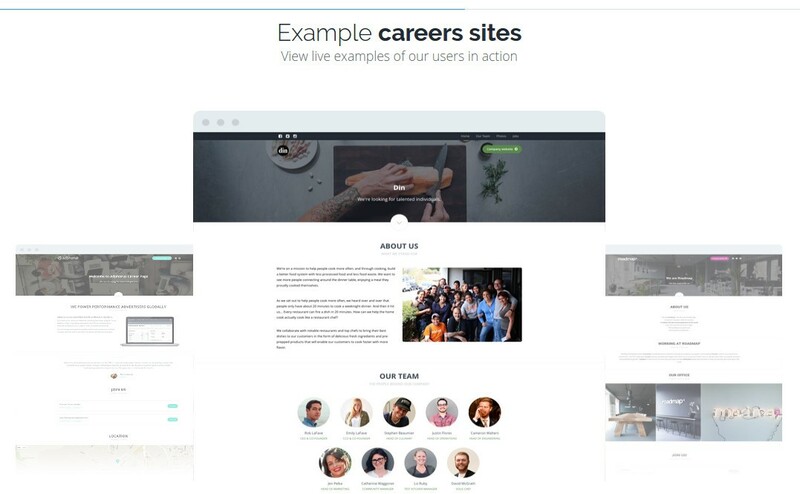 This is a collection of Live Example Career Sites created using Recruitee's editor. These allow you to get a sense of what your career site will look like when you sign up for a plan. You can find these example sites near the bottom of the Employee Branding page at the Recruitee site. If you want to display job listings on your own web site (as opposed to, or in addition to, your hosted site at Recruitee) these tools make it possible. If you want to use either of these you will need to contact Support. They will work with you on implementing the interface you need. Recruitee keeps all your data safe on encrypted servers. You retain full ownership of your data and can export it at any time with the help or Recruitee's Support staff. Contact them for details. Recruitee offers five pricing plans. The plans are distinguished by the number of active jobs they support. For example, the Starter Plan supports 1 active job, while the Corporate Plan can handle 20 active jobs. The top tier is the Enterprise Plan, which is customized to meet your organization's needs. Each plan gives you access to the full set of features offered by the platform. The prices range from $19 per month or $190 per year for Starter, to $199 per month to $1990 per year for Corporate. The price for the Enterprise Plan will depend on what you negotiate with Recruitee. Recruitee can be a powerful tool in your quest to attract and hire the best employees. As you've seen here, it has many characteristics that could make hiring a better, faster, more cost-effective process for your company. But you will never know for sure if a tool like this is right for you until you try it yourself. 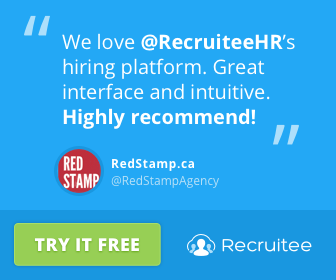 To that end, Recruitee offers a free, 18 day trial program. Simply fill out the sign up form to create a company account and you are ready to go. No credit card is required. You will be able to set up a Recruitee-hosted career site, post jobs, and experience the entire process with a live site. There's no better way to understand what Recruitee can do for you and how it would fit into your organization. To start your own free Recruitee trial, click the image below. We provide staffing software that are used by the corporate HR, Recruiters and Staffing Agencies. Get a 18 days free trial. Full access to features! 18 days free trial. Start your trial and we will help you set up and make a careers site for your company for free!